This book has trees bursting out of the edges but also expounds on topics from causes of global warming to why there is so much biodiversity in the tropics. Well worth putting on your 2007 list of books to read - preferably at the top. Tudge defines a tree as "a big plant with a stick up the middle" and he points out that we evolved from creatures who lived in trees and how also - from a biological perspective - "the human debt to trees is absolute". This work is extremely readable - scattered with humorous asides and relevant, but entertaining, anecdotes. Describing the early cataloguing of trees in South America, Colin Tudge describes how in about 1800 a German (Alexander von Humboldt) together with a Frenchman (Bonpland) collected over 12,000 plant specimens including 3,000 new ones. This exercise doubled the number of known species in the Western hemisphere. He goes on to describe the tallest trees (Californian Redwoods, some over 100 metres tall), the most ancient (Bristlecone pines) and the most drought resistant (a Saharan Cypress). Tudge explains the basic principles of naming whether names are in Greek, Latin, English, Hindi or any other language: the first name is "generic" denoting the name of the genus and the second is the species. Linnaeus, a brilliant and eccentric Swede first formalised this system. Tree naming is one thing but identification is quite another and DNA testing has had a big impact including revealing more accurately the relations between different species and, rather cleverly, the age of different species. The Secret Life of Trees has woven into it explanations of continental drift, the great extinctions, ice ages and the fossil record so that reading this book makes one experience the whole history of the planet from the point of view of its trees. Looking forward, Tudge puts up some ideas about how agroforestry could reduce carbon emissions and make for a more sustainable world but to me he seemed inconsistent in his comments on eco-tourism. He advocates development of tourism in remote places but the implied long haul flights sit very uneasily with his concern to reduce emissions of greenhouse gases. Perhaps the most memorable parts of this tour of world trees were sections describing why trees engage in sexual reproduction (certainly not for pleasure or because they have to, but because this enables genetic diversity), and how animals help with their pollination and seed distribution - giraffes can be pollinators with acacias when browsing and bats with some of the 750 fig species. Enough of summary - read the book! 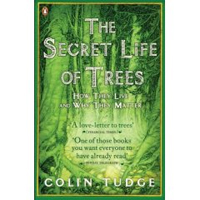 - The Secret Life of Trees by Colin Tudge. Trees of Britain and Ireland – a celebration of trees.